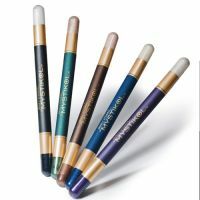 This is a decent mineral eyeliner for a soft, smoky look. You won't get precise lines with this, but I don't think that's the point. I like how it goes on, really easy to use. However, it did transfer to my upper eyelid (I have hooded eyes). I love a soft, subtle eyeliner, so this is a great product for me. It was easy to apply, and the formula is easy to push into the little spaces between each lash. I'm very partial to the purple (excuse me, amethyst) because it looks almost black, but the hint of color still brings out the green in my eyes.